Seraphina: In a world where dragons and humans coexist in an uneasy truce and dragons can assume human form, Seraphina, whose mother died giving birth to her, grapples with her own identity amid magical secrets and royal scandals, while she struggles to accept and develop her extraordinary musical talents. Shadow Scale: Seraphina, half-dragon and half-human, searches for others like her who can make the difference in the war between dragons and humans in the kingdom of Goredd. Roben’s Thoughts: Why did I read these books? Dragons! I’ll read almost anything with dragons in it. Hartman – in her debut novel – has created a world where humans and dragons co-exist under an uneasy peace treaty. Very few humans actually like dragons – they find them to be monsters. And for the dragons – well, they can take human form. Usually the people around them know that they are dragons – but not always. The dragons could also wipe the humans out if they chose to do so – but they are very logical, mathematical creatures that feel they can learn something from the humans. The story revolves around Seraphina Dombegh who just happens to be part dragon and part human. But Seraphina does not look like a dragon. In fact, she looks like any other 16 year old girl. Except for a few scales on one arm. It’s what goes on in her head – and her extraordinary musical talent – that set her apart from others. She tends a garden full of “grotesques” in her head – other half-human/half-dragons that inhabit her world. If left untended, they would drive her mad. Her father is at a loss what to do with her, so most of her growing up years are spent with her maternal Uncle Orma. He is a dragon – but maintains human form as a music instructor. Because of her musical abilities, Seraphina is chosen to be music mistress at the royal palace and teach harpsichord to Princess Glisselda. Thus the book includes court intrigue, romance, and murder! Shadow Scale is a companion book to Seraphina.. As the story continues, Seraphina is off to find the other grotesques. Princes Glisselda is still betrothed to Lucien Kiggs, and Lucien is still in love with Seraphina. Hartman is an amazing world builder. If you are like me, you’ll have dreams of Goredd and Porphyry; you’ll want to hear Seraphina play her flute and oud; watch Abdo dance; and see the dragons fly. I loved both of Hartman’s books and hope she writes more! She said Shadow Scale is the last one in the Seraphina series – but she left it open-ended so hopefully we will be able to revisit this magical world. 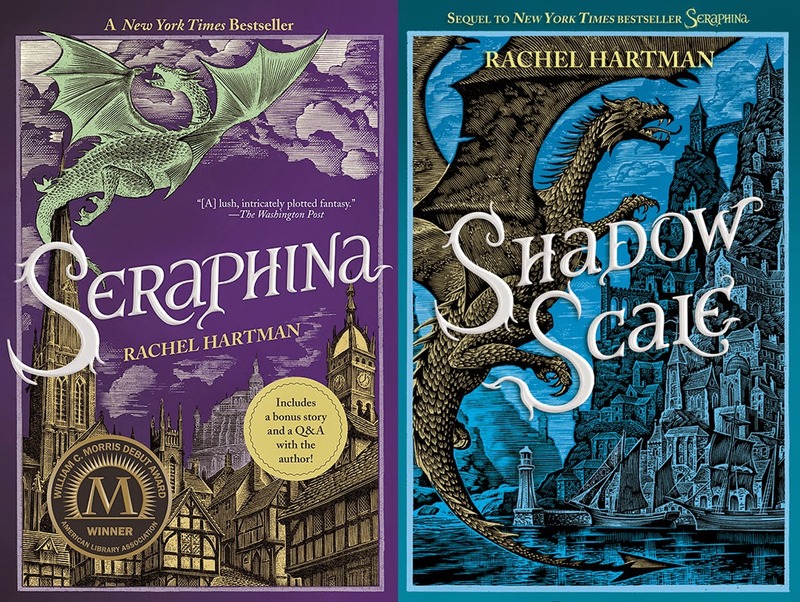 Who I Would Recommend to: Anyone 8th grade and up that loves dragons would enjoy Seraphina and Shadow Scale. They are also filled with mystery, coming-of-age angst, star-crossed romance, rumblings of war and political intrigue. So it has a little bit of something for everyone. This two for one blog was brought to you by Roben, part of the Smith Library Youth Services Team!